Eilene has been asking for latkes lately. She has a friend coming over for dinner, so this seems like a good day to make them. Always trying new things, I decided to use tarragon and replace the usual apple sauce and sour cream with pear sauce and crème fraiche. Jan has dietary restrictions on too much fat, so I cannot cook latke in half an inch of oil. 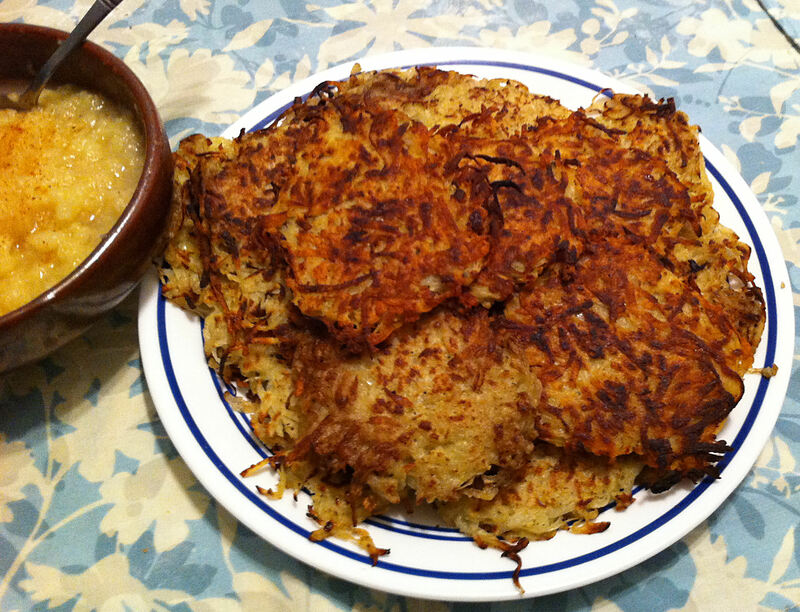 As a result, I can never quite get the greasy, crisp fully-cooked goodness of a latke cooked in the traditional way. Using as little oil as I do, I have to bake the finished latke—to fully cook the potatoes inside without burning the exterior. 1. Peel and shred the potatoes. 2. Sprinkle them with the salt and toss to distribute the salt. 3. Let the potatoes sweat for 15 minutes. Take handfuls of the potatoes and squeeze them to remove as much liquid as you can. Tip: This process leaves you with 5-6 oval shaped pills of potatoes. 4. Let the pills sit for 5 more minutes and squeeze them again to removes more liquid. 5. Pull the pills apart and put the potatoes in a bowl. 6. Mix in the grated onion, sage, pepper, and eggs. 7. Mix in the panko and let the mixture rest for 5-10 minutes. Give the mix a final stir. Tip: This is to give the bread time to absorb the moisture. 8. Place an empty baking sheet in a 300° F oven. Tip: This is a place to put the latke to keep them warm and to finish cooking them. 9. Heat one tablespoon of oil in a large nonstick skillet over medium-high heat. 10. When the oil is shimmering, distribute three 1/3 cup scoops around the pan. Use the back of a spatula to flatten the mounds into 3 inch pancakes. 11. Fry the latkes until they are crispy and golden, 2 to 3 minutes per side. 12. Transfer the finished latke to the baking sheet in the oven. Note: Give the final batch of latkes at least 10 minutes in the oven to finish cooking. If you are hungry you may take the first ones out and serve them while the last batch finishes baking. 13. Adding more oil as needed, continue frying the latke, until you run out of potato mixture. Tip: You may need to reduce the heat to prevent the later batches from burning. 14. Serve with pear sauce or crème fraiche on the side. Note: Or you can go more traditional and use apple sauce and sour cream.